Next month's Fortuna update is going to be wild. 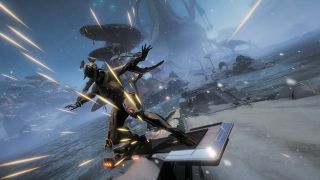 The first time I went dashing through Warframe’s first levels, years ago, I never would have guessed it would morph into a futuristic space-ninja Tony Hawk game. And yet, on Monday I watched a Digital Extremes rep grinding rails in the open world zone of Orb Vallis. She leapt off the rail with a 360 spin and earned a few more points of approval with the region’s skater gang in the process. They call themselves the Ventkids. They live in a big vent and have developed their own brand of music, described as “Stomp meets ska”. As I said, this game has changed a lot. This gorgeous, icy new zone coming to Warframe early November as part of the Fortuna update. Fortuna is the name of a futuristic town located beneath the ice and the coolant rivers. There you’ll find the Ventkids jamming, along with other Corpus debt-slaves called the Solaris. The new zone has bespoke crafting materials and vendors that allow you to assemble MOA pets and ‘Kitguns’ for your secondary slot. There are bounties too, and this time DE plan for you to pick many of them up in the open world—no more glitching into 12 other players as you pick up new ones from Konzu in Cetus. Whereas the Plains of Eidolon focused on the Grineer, Orb Vallis belongs to Corpus forces, and that shows in the tech you can craft in this zone. I watched Digital Extremes assemble a Kitgun from a combination of components with names like ‘ramble grip’ and ‘bellows loader’. The results look suitably boxy and kitbashed and in-keeping with the style of Corpus’ foot troops. You can wield the results of your tinkering in your secondary slot. The MOA companion is surprisingly endearing for a big leggy robot. You can set its head, core, weapon, and legs, and then program your pal with an ‘emotion module’ that changes their sounds and posture. Wave at a cheerful MOA and they’ll wave back with a hopping one-legged motion. An aggressive MOA will simply ignore you and sulk. The expansion is full of small personable details like this. There will be conservation sub-objectives in the open world that involve setting bait and stealthily tranquilising animals to preserve them. You can use EMP spears to catch 14 species of robot fish from rivers of coolant. In addition to military outposts and a Corpus temple, there are hidden caves everywhere with their own biomes. Oh, and there are mushroom forests full of useful crafting materials. The mix of activities, and the fact that you can pick up bounties in Orb Vallis and roam around with them, is part of an effort to try and give Fortuna a better sense of flow than the Plains of Eidolon. Ventkids are scattered throughout the zone, and you can talk to them to trigger hoverboard races. With activities like this, DE hope to keep players there longer pursuing layered objectives and working towards the zone’s new gear. Like Plains of Eidolon, it sounds like Orb Vallis will be a self-contained grind. You do missions to earn Fortuna materials to spend on Fortuna loot. We’ll see how this feels when the update is out, but that structure made Plains of Eidolon feel a bit segregated away from the main star chart progression, as Steven noted on launch. DE isn’t talking about high-level challenges in Orb Vallis yet, but there are huge dormant spider bots that may awaken in a future update. We did get to see some smaller spider bots during the guided tour though. In Orb Vallis killing Corpus causes the zone’s security levels to increase, and tougher enemies start showing up in waves. You can lay low to bring security levels down, or shoot siren pillars. It sounds like triggering high security alerts might be an efficient way to complete certain bounties. The Fortuna update doesn't have a precise release date, but expect it some time in early November. If all goes to plan, we should get a new Warframe at the same time: the blood mage Garuda. As with all of Warframe's updates, it's free, cementing the game's position as one of the best free to play games on PC.